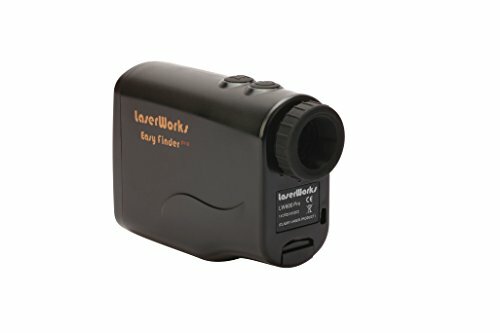 --Accurate measurement: With integrated 6x magnification and 21mm objective lens, Laser golf rangefinder enables the accuracy to ± 1.0 m , measure up to 1000m, providing you perfect measuring results. --Pinsensor: With function of pinsensor, laser rangefinder can seek and sense the nearest flagpole, help you to manage the play. --Multiple functions: You can measure distance, speed with Laser 1000, to satisfy your outdoor sport needs for golf, hunting, shooting, racing, etc. --Switchable units: You can switch among yard and metric units, to satisfy different preferences. --Durable quality: it adopts high-quality engineering plastics to build the house, and sealing technique for the key parts, make it prevent moisture, dust and debris. The product is protected against dust and water splashes, but CAN NOT be immersed in the water. To ensure more accurate reads, the laser beam should be as vertical as possible to the object to be measured, please not in an extreme oblique angel. Please do not measure through glass or objects that may cause refraction or in very dark color, and then cause measuring error accordingly. Distance and speed can be measured with this high-tech professional range finder. It measures exact distance to target from 4 to 600m(656 yards). 6X magnification. LCD illumination control. IP65 water resistant. What you will get: Laser Rangefinder with Original Package, Carry Bag,Lens Cloth, Lithium Battery, Operation Manual and a lense. If you have any questions about this product by Qliwa, contact us by completing and submitting the form below. If you are looking for a specif part number, please include it with your message.